I’m a strong believe that the things we fill our minds with, inform who we become. So if you fill your mind with rubbish, rubbish is what your mind is full of. If you fill it with good stuff, good stuff is what it is full of. 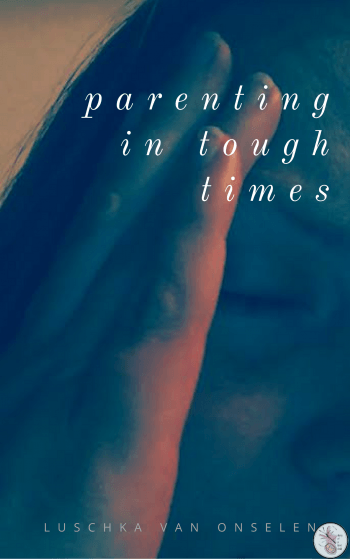 This belief steers my parenting decisions a lot of the time, so that I really try to provide positive and uplifting resources along with the stories and make-believe and games in my girls’ lives. 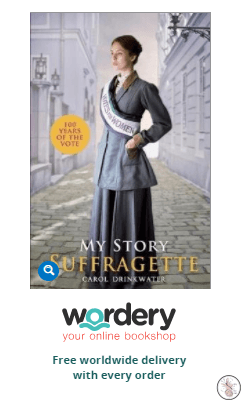 It’s because of this that I was quite excited to find a children’s story for the Suffragettes, especially with this year being the 100th anniversary of (some) women’s right to vote. 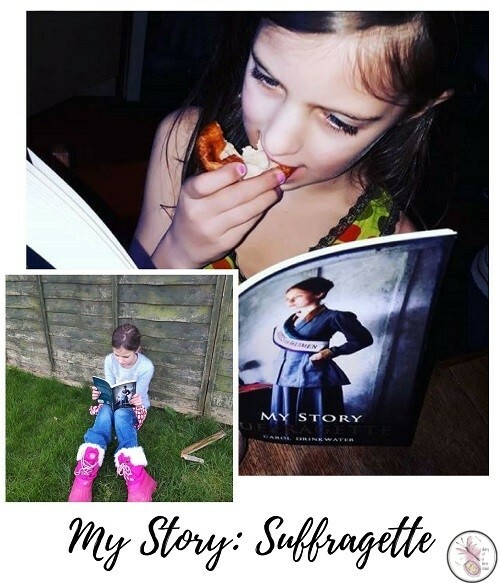 When 8 year old Ameli started reading My Story Suffragette I was really thrilled that she read it because she wanted to, rather than because it was something I’d ‘set’ for her to read. 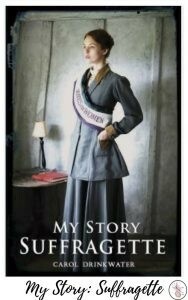 My Story Suffragette is a fictional story set in the actual happenings during the ehight of the Suffragette movement. The book starts with Dolly, taken from her a very poor Eastside London family in a series of events that unfold a few pages in, and sent by a rich benefactor to a private school for a decent education. As time unfolds, Dolly becomes involved in the Suffragette movement, and goes through an emotional inner battle as she tries to find her place somewhere between her very poor background and her priviledged education, not wanting to squander what she’s been given, but wanting to be involved in the changing status of women in both politics and society. While Dolly’s story is fictional, the events and happenings around it are not, which makes this a really interesting book for young readers, because it introduces them to a very heavy topic in a story format. I did read the book before I gave it to 8 year old Ameli to read, because a lot of the Suffragette story isn’t really very pretty and I wanted to be prepared for any questions that might come up, but in all honesty, while there were some parts she thought weren’t very ‘nice’ (her word) she took it pretty much at face value and didn’t dwell too much on the ‘ugly’. There’s a great quote by Isadora Duncan, who says that children’s literature doesn’t really need to be too heavily censored because “What one has not experienced, one will never understand in print” and I think this book bares out that fact. While Ameli couldn’t understand that force feeding and kicking and beating a woman on the ground aren’t ‘nice’ she doesn’t have an existing mental image to frame those pasages around, so I felt them more harsh than she did. My Story Suffragette is 190 A5-ish pages, so while it’s a decently sized chapter book for a child, it’s not really long. Ameli carried it around everywhere and sat down to read whever she had a chance. She was engrossed in it. I was also really interested in the adult reactions to her reading the book. Many were really impressed that she was reading a book on this particular topic, and many (like myself) have never really read anything beyond the odd article or movie on the subject. 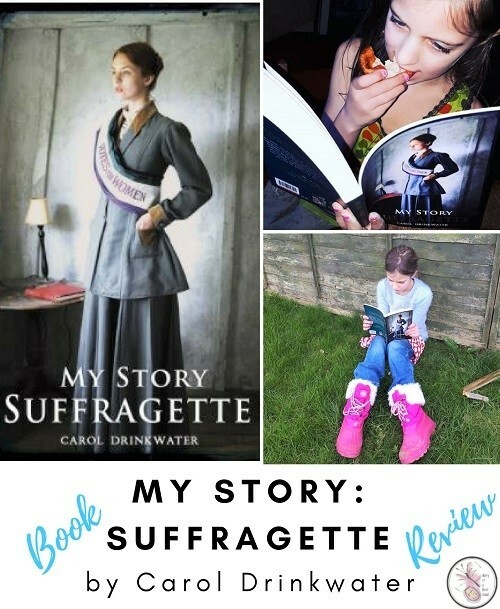 I’m pleased that she’s read it, and I think it’s good that she has a better understanding of what celebrating 100 years of Women’s Right to Vote means now and it happens to tie in well to our study on Inspirational Women in History But you can hear her own thoughts on the book in this short video below as she offers us her first ever book review of My Story Suffragette.